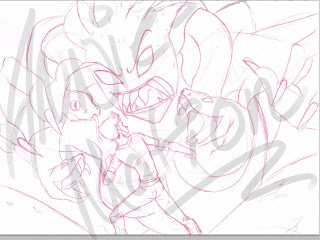 This is the rough line art for my proportion/scale assignment for layout class. It's mostly for my own pleasure though. It's Sherry and his mother! Isn't she a charmer? I was thinking about the story behind this for a while, and it was fun because I had to run back to the storyline I'd given up on for him, very heavily based in Greek Mythology. Sherlock used to be named Nikodemus, but when I realized he was the baby I'd always wanted to create and name after Sherlock Holmes, I switched Nikodemus to his middle name and named him after Sherlock. He's very dear to me. Sherry's father was a human, while his mother was a gorgon. I'm going to take liberties and say his mother can change her physical appearance, else the biology would have never worked. Anyways, Sherry, was, along with his siblings, hatched, as snakes are. Having taken very much after his father in shape, his sisters drove him from the nest, and Sherry was introduced into the world. Just by being born part god (liberties. I take them. ), he was taking part in a tournament that had been carrying on for years- and the winner was granted permission to return to olympus. Despite being ashamed of his ability to turn people to stone, Sherlock thought if he could win, he could return home to his mother and his sisters. Unfortunately, being well, Sherlock, he was quickly beaten down, and if it wasn't for Ainmire he wouldn't have survived. Though he probably would have stayed with Kara, for this assignment I toyed with the idea that he tried to return home anyways. He wasn't greeted favourably. Sadface. Ignore the plot hole that both of these guys would have turned each other to stone the second they made eye contact, hm? This is my newest painting for painting class. 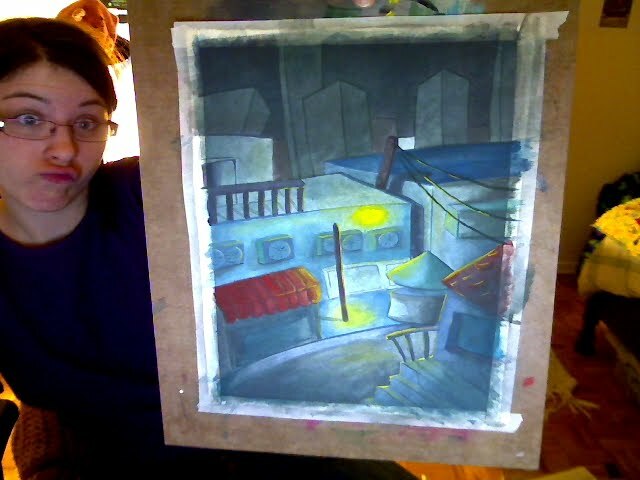 Gotta say, I really hate gouache-- but this stuff wasn't too bad. It worked almost like water colour and I wasn't just shoving colours around and picking up under colours and creating mud, which is nice. I've been requested to attend extra painting classes on Mondays- which is a huge bummer, but I'm honestly scared of what will happen if I don't go. My teacher thinks I'm a bit thick in the head, on top of talentless. Don't worry, I got rid of that distracting white square in the back there. I'm pretty happy with this painting, I got the gloomy look I was looking for. I left out a lot of wires and busy stuff from my first design including all the smog and dirt I was going to sponge in. I look at this and I don't think "What a piece of s#*t", I think, "Huh, that kinda looks like where I think Rebel raised Ninja. No, I'm not an amazing painter, but I still like it. Not Medusa, precisely. Just a gorgon; I assumed through the course of history the sisters would have had many offspring, any of which could have been Sherry's mum.